Stock photo of an old brick building dating back to 1896 in the town of Kaslo, Central Kootenay, British Columbia, Canada. Old brick building dates back to 1896 in the town of Kaslo, Central Kootenay, British Columbia. 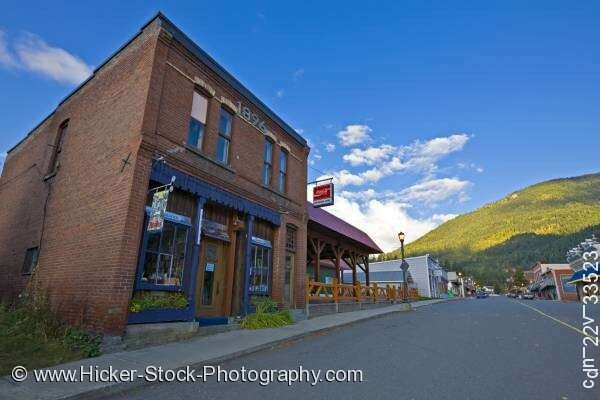 This stock photo shows an old two story brick building dating back to 1896 in the town of Kaslo, Central Kootenay, British Columbia, Canada. An old two story brick building of a store is dated 1896. The large numbers of the date sit on the second story over the building along the top frame of the window sills. Four windows are on the front of the building of the second floor. Two large glass windows sit on either side of the wood door on the first floor of the store. Another door sits to the right of the window just before the open porch. On the right side of the building is a covered porch with a wood railing in front of it. A sidewalk runs in front of the old building that leads into the town of Kaslo. Stores run along both sides of the street. Old brick building dating back to 1896 in the town of Kaslo, Central Kootenay, British Columbia, Canada.